We welcome you to visit this equine property that has it all for the horse professional or enthusiast. 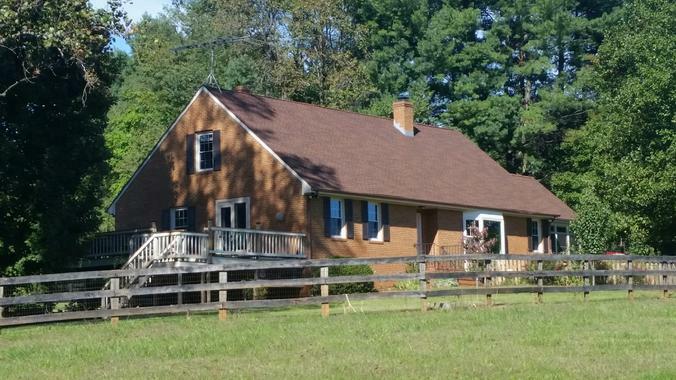 Well constructed barns, feeding room, tack room, and run-ins start the facilities. A finished room, kitchenette and half bath in the main barn provide a central base for entertaining .... or possibly a living space for a farm helper. Relax by the in-ground pool and tiki-hut in your caribbean get-away or work out the horses in the large all-season riding arena just steps away. The two story fully remodeled brick home with walk-out basement provide lots of comfortable living space for the family. Kitchen, bedrooms, living room, dining room, two full baths, laundry and walk-in pantry on the main level allow for one-level living if that is needed. A full bedroom suite, full bath, wet bar, and formal office upstairs make that level a great place to work or sleep comfortably. Downstairs a billiard room and 4th bedroom is great for entertaining or a teenage hangout.